I do not like horror flicks. They scare me. That being said, I watch every vampire movie I can get my hands on [sans teeny-bopper Twilight]. Just in case I ever meet one; I’ve got to be prepared. I shared this with my brother and Big Bro laid a big one on me, “If you think about it, zombies are more likely to happen. Maybe not ‘zombies’ but definitely zombie-like qualities in humans.” It got me thinking alright. So I started watching zombie movies. And that was a bad idea. I hate zombies. Especially zombie movies. Especially zombie movies where the zombies are fast. This, of course, does not include Zombie Land because I found it to be very entertaining and funny. Even though the zombies were fast. It makes me feel queasy just thinking about it. Vampires don’t chase – they lead you to them. Or whip around you so fast your head starts spinning. Zombies chase. End of story. So Big Bro recommended a book. “Bro, I cannot read a book about zombies. I will have nightmares in my nightmares. Me and zombies are not friends.” He told me the book wasn’t scary and that he really enjoyed it and I need to just read it. So I did. 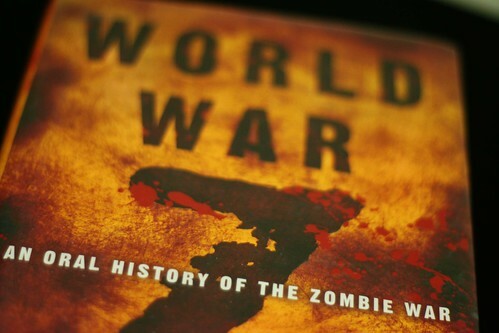 It’s called World War Z: An Oral History of the Zombie War by Max Brooks. Is it scary? Yes it is. Not in the sense that it’s horrific or suspenseful but in the sense that it’s realistic. I started reading it back in September and then the nightmares started. I had to stop. My friends were being attacked in my dreams and random hands and arms were falling off. Since I borrow books from the library, I had to return it when someone else wanted to read it but I picked it up again this month to finish the last half. And the nightmares came back. More attacks, more falling body parts and the feeling of being chased. But I trudged through it. I needed to be prepared. And now I know more about zombies. Mission accomplished. Zombies. Zead-heads. Zachs. The Infected. Reanimated humans. Whatever you want to call them. They are slow. They are stupid. And all they really want is their next meal. However, they are strong, they are determined and relentless and they pretty much don’t die until you kill their brain. Oh, and they’re disgusting because they bloat and body parts don’t work correctly and it’s just eww. Though this book is fictional, it reads realistically. The author [fictionally] interviews several different people to learn about their experiences through the zombie war – from the first recorded case of reanimation to the almost-end of the epidemic. And these “experiences” freaked me out. Like I said, realistic. Realistic, realistic, realistic. But Big Bro is right – this is more likely to happen than running into vampires. Maybe. 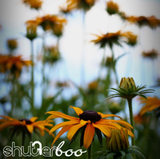 ~ by shutterboo on March 12, 2010.
my advice is to go and watch shaun of the dead immediately. i’m not saying you’ll welcome zombies with open arms, but you will point and laugh at them. plus, it’s a really awesome movie. Seen it. Liked it. Still had bad dreams. I’m telling ya, I’ve got the imagination of a seven year old. Now Dawn of the Dead… I had to walk out of the room several times and then decided it was just best if I cleaned out my closet instead of watching the movie. I’m a wuss. I’m OK with that. what a fun entry. and as for shaun of the dead, one of my faves for some sick reason. I’m with you. Me no like scary zombie movies. So I’m not even gonna think about looking up this book at my local library. I do like edgy stuff though. No I haven’t. I’ll write them on my list! It reads like a survival guide not like a story and not like an oral history (like WWZ). It is fun, but I did not finish it, but I can see it being a fun gift combo for zombie lovers. The word “zombie” and the word “lover” really shouldn’t be side by side. Or in the same sentence for that matter. Isn’t having those two words together illegal in most states? It reads like a real oral history. A good book. I’ve just got a warped imagination. Speaking of zombies, there is a human vs zombie game of tag @ the Waterfront here in Louisville Saturday night. About 750 hundred confirmed guests on Facebook. It starts with only 1 zombie… would be interesting to see but I hate being chased. And we don’t know if these are fast zombies or not. Fast zombies are bad. that is awesome… i am going to have to suggest setting that up here in birmingham. my friends would be all about it! I am highly impressed that you finished this book. I think I could handle imaginative scary better than realistic scary (not that I could really handle either!). But I know who to turn to for advice when the zombies come! Dude – get a gun, a sharp weapon with a long handle and good running shoes.